Chernikowski's 35mm black-and-white stills (a sampling of which is included in the Museum of Modern Art’s Looking at Music: Side 2 exhibit this fall) exude more than just an appreciation for the magnetic personalities they capture, but also a sense of discovery. "My encounters with Jean-Michel Basquiat were frequently intense. We both rented from Andy Warhol and shared a courtyard, but we didn’t really know each other. I looked out the back window one day and saw Jean-Michel and his assistant in their doorway waving, so I waved back. They waved more frantically, so I opened the door. Jean-Michel said, “There’s a dead guy out here, what should we do?" I suggested they call 911. They did, and after the police inspected, we were informed that the deceased, who had a screwdriver sticking out of his back pocket, had “jumped, fallen, or was pushed.” We never learned which." In recent years, 1970s New York has attained the cultural status of an enshrined era: an almost mythological time during which creativity soared in the wake of economic collapse. Fascination with this era naturally centers upon a host of its extraordinary figures -- figures whose sympathetic ideas about art gave rise to both the Downtown Scene and Punk Rock. While their artistic legacies are certainly well preserved in their own enduring works, the era’s extensive photographic record provides today’s onlookers with added insights into their legendary life stories. To hear any number of photographer Stephanie Chernikowski’s enthralling anecdotes from this dynamic segment of New York’s history -- such as the one involving Basquiat above – is to be regaled by one of modern art’s most passionate disciples and practitioners. A New Yorker of some 35 years, she can count amongst her life’s accomplishments the transfiguration of urban documentary into a rich body of powerfully intimate art. Her 35mm black-and-white stills (a sampling of which is included in the Museum of Modern Art’s Looking at Music: Side 2 exhibit this fall) exude more than just an appreciation for the magnetic personalities they capture, but also a sense of discovery. The secret ingredient, I would suggest, is wonder. A restless Floridian, I myself moved to Manhattan in the fall of 2005 bundled up for college at NYU. Four years later, my exiting impressions of the place were that of a metropolis still vivacious and frenetic but essentially tame. Although the borough’s rich character remains far from uninteresting, experience holds that a nighttime stroll down the Bowery in 2009 entails about as much danger, if not less, as the weekend rush at IKEA. By all accounts, the same statement could scarcely be made even 20 years ago. With the increased security of the post-Giuliani era, it’s become easy to forget that, through the 1970s, a large part of Gotham’s allure was colored by its permeating seediness. Even more remarkable, though, is the fact that a uniquely vibrant cultural movement was able to take root amid such rampant urban decay. "It was very impulsive. My partner of many years decided to move to Boston and asked me if I wanted to keep the apartment we shared. 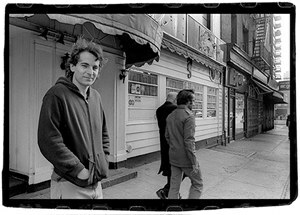 I had just recently gotten into photography, didn’t know what I didn’t know, and had always wanted to live in New York City, so I told him no and moved to Greenwich Village." Unsurprisingly, the city’s influence is a ubiquitous force in her work, coming through either in the austere furniture of raggedly domesticated industrial spaces or the sometimes-startling gauntness of the subjects themselves. People are products of their environments, or so they say, and one certainly gets a sense of this when looking at the world through Chernikowski’s viewfinder. By her own admission, further influences come from the black-and-white films of Federico Fellini, Michelangelo Antonioni, and Ingmar Bergman, as well as still photographers such as Henri Cartier-Bresson, Robert Frank, Richard Avedon, and early Annie Liebovitz. It’s readily apparent that rock photography, like rock journalism, had become an art in and of itself in the 1970s. Subsequently, the term “rock photography” implies more than just simply photographs of rock musicians, but rather a distinct style of portraiture. Indeed, it is a medium in which sublimity is quite often chiefly achieved through candor. 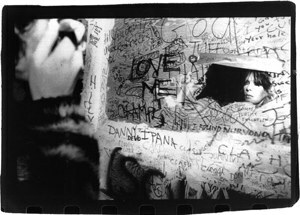 There is a photo of Chernikowski’s, entitled “Mirror,” which captures a stunning Nico, glimpsed suddenly in reflection in some suitably urban environment. It’s a haunting visual, and one that’s imbued with an undeniably electric power: the storied ice-queen whose stark, tormented beauty is rendered in harsh grays and black. The mirror itself could be called a shard, and the face that lingers upon it is fairly described as horrible, even inhuman. The effect recalls the kind of shock one receives at the climax of an Edgar Allen Poe story, faced down by the ghastly countenance of some revenant damsel -- beautiful but for the fright of the moment. Its bleakness even rivals that of the singer’s music -- a body of work that is draped in the darkest shades of human emotion -- and achieves much of its own beauty through the arousal of the listener’s innermost sympathies. Another still (which, like “Mirror”, was recently exhibited at the Morrison Hotel Gallery on Bowery) captures an historic one-off Sid Vicious gig at Max’s Kansas City, dated 1979. 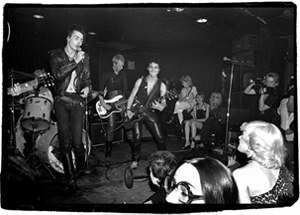 Despite its recorded date, however, the photograph was more likely taken sometime in early 1978, given the appearance of Nancy Spungen (who died on October 12th of that year), who looks on, ominously, from stage left. Sid himself appears in characteristic form -- rail thin and pallid in his beloved leather jacket, upper lip crooked as he snarls through an off-key Stooges cover, or maybe the hot-rodded second half of “My Way”. What the photograph conveys best is Sid’s incredible charisma. He isn’t at the center of the photo or even looking towards the camera. Instead, it’s Sylvain Sylvain of the New York Dolls who meets the viewer’s eye head-on, his face lit up in a toothy grin as he claws the song’s next barre chord on a Gibson SG. Nevertheless, it’s Sid who commands attention, his own sights seemingly set upon a target in the middle distance that only he can see. He’s decked out like Marlon Brando in The Wild One, minus the hat, and his left leg’s cocked inward in a half-conscious imitation of Elvis. Vicious was a known attention junkie who desperately craved adulation and obsessed over his appearance. His suicide note even specified that he be buried just the way he is pictured here. His self-obsession indeed comes through in the photo, leaving the viewer torn between fascination and pity. He was the worst kind of role model: the archetypal addict of fame, and yet his legendary status as punk rock personified endures because he was, irrevocably, a true star. To deem him an artist is to take it too far, but he was, nonetheless, one of the boldest personalities of an age rife with dynamos. "I met Alex when the Voice gave me my first assignment, to shoot him. He had moved to the city the day before, and when I got there for the shoot, his girlfriend Lesa had just left to return to Memphis where they had been living. He was heartbroken and I spent most of the shoot listening to him mourn his loss. We became fast friends. We still are. I had wandered into the Voice a few weeks earlier with photos of a South African musician I had heard they were doing a story on. They loved the pictures and gave me a huge spread." This was 1977. It was, as Chernikowski’s recollection suggests, a period of dramatic transition for the singer. Looking at two photos from the shoot, Chilton does, in fact, appear worn out or preoccupied. 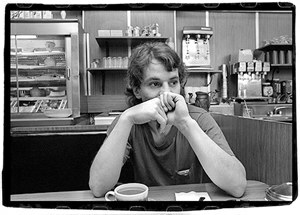 In one, he’s pictured sitting in a diner with his hands bridged before his face, gaze distractedly aimed somewhere off to his left. He wears a solid-color t-shirt with a stretched-out collar, a pack of cigarettes bulging from the front chest pocket. In the other, he’s seen standing on the sidewalk facing the photographer, squinting against the wind and wearing a wan, seemingly perfunctory smile. His hands are thrust into the pockets of a tattered zip-down hoodie with the seams splitting. In a photo taken two years later, Chilton appears far more at ease. He is glimpsed here walking down an unknown back alley of New York, clad in a denim jacket and scarf. His expression is once again vague -- perhaps something between sober reflection and nostalgia. There’s a distinct air of uncertainty, and yet one detects a great deal more confidence in the man. This later photo (dated 1979) also conveys movement -- both physically down an alleyway and figuratively, in a larger, emotional sense. Still, the backdrop is dreary, and from Chilton’s clothing we can assume that it’s either fall or early spring. As with most photographs of people, the implications contained within are vast. Nevertheless, understatement is the critical element. The moment’s casualness becomes the photograph’s defining quality: a man walks down the street, a row of boarded-up windows and a pile of empty cardboard boxes in the background. 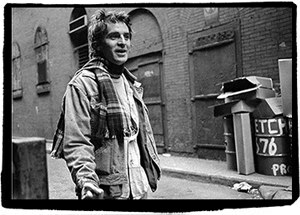 Chilton, a fascinatingly prescient songwriter who seems at times confused by the amount of critical acclaim he has received, is presented here in the simplest of situations, moving from point A to point B. It’s a conscious stylistic choice made by the artist behind the camera, for whom body language houses an infinity of meaning. “I’ve never had goals,” says Chernikowski, “I’ve enjoyed being led around by my eyes. Maybe you could say my goal has always been to steal souls, or touch them. I’m not interested in building monuments to the people I shoot, but rather in sharing an intimacy -- a look, a gesture.” This focus on intimacy of course comes through again and again in her photography: in the abrupt flash of Nico’s reflection or Alex Chilton’s wandering gaze. 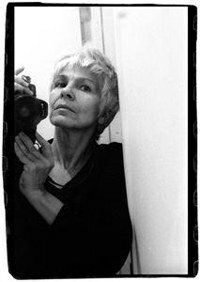 But her evocation of the old superstition that cameras steal souls also highlights Chernikowski’s particular artistic spirit -- one that is paradoxically generous and possessive. From the earliest years of what she calls her “visual obsession,” she has sought to both capture and share. To this day, people make the argument that photography is a lesser art, simply because it involves the fairly simple process of recording moments. However, this assessment takes for granted a talented photographer’s gifts of vision and timing, not to mention an unflagging dedication to being at the right place at the right time. What’s more, it grossly underestimates the artistic impulse and its evolution against technology. Thankfully, though, rock photography has long had its exponents in the art world. Running through the end of November, Looking at Music: Side 2 is a powerful exhibit now on display at New York’s Museum of Modern Art. The show prominently features Chernikowski’s work (including a fantastic shot of Kim Gordon and Thurston Moore from 1983), along with “music videos, super-8 films, drawings, photographs, and zines from MoMA’s collection that explore the melding of music, media, and visual art in the final decades leading up to the 21st century.” The exhibition, along with the stunning 1996 book Dream Baby Dream: Images from the Blank Generation (unfortunately now out-of-print), marks a highpoint in the photographer’s already distinguished career.